Listen! If you want to wait around for Link to save Hyrule, it may take weeks or even months for him to finally battle it out with Ganondorf. He spends his sweet time collecting all kinds of weird tools before he finally decides to start the final battle against the evil boss. In that amount of time, Hryule might be in complete shambles! No, if you want to keep your kingdom safe from all the evils of the world, you have to do it yourself and that means getting all geared up as Zelda, grabbing your bow and heading out to shoot Ganondorf right in the keister with one of your patented light arrows. Of course, if you plan on doing all that, it begins with this Adult Zelda Costume. 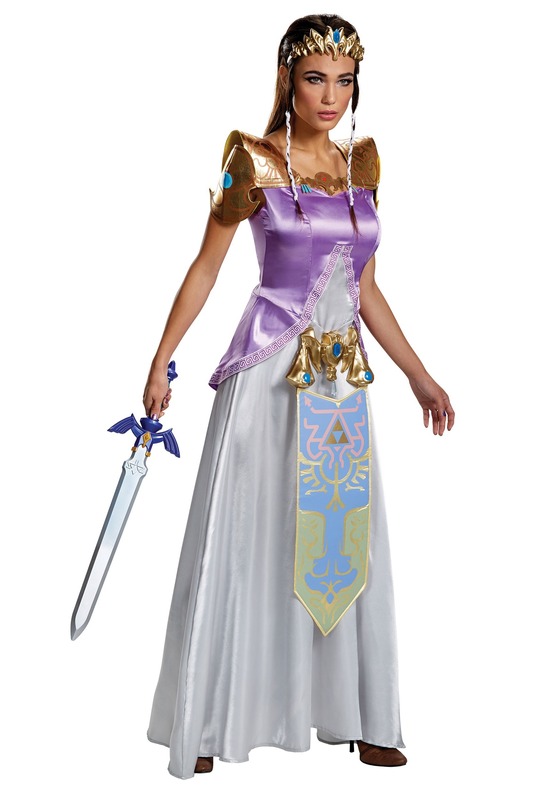 This Deluxe Zelda Costume comes fully licensed from the classic Nintendo video game series. The dress has a satin lavender top to recreate the look worn by the Hyrule princess and it even features a Hylian style apron in the front to continue the regal look. The shoulders also convey a royal attitude with shimmering gold and a light bronze colored patterning. Once you have it on, you may just feel the urge to shoot a few light arrows at intruding Moblins! It's a great look for any fan of the series, or any girl who wants to show Link how to save the kingdom in a timely fashion without dilly dallying around for so long! This costume is not well made and the shoulder cuffs don't fit right. The Cleopatra costume is adorable and well made. This is like a Walmart costume....disappointed.